Lanzarote is a great one to explore, with lots of little towns and villages to discover. Why not venture to some of the local markets and see what trinkets and goodies there are to be had. The town of Teguise is inland slightly from Santa Rosa, roughly a 20-minute drive from the coast. 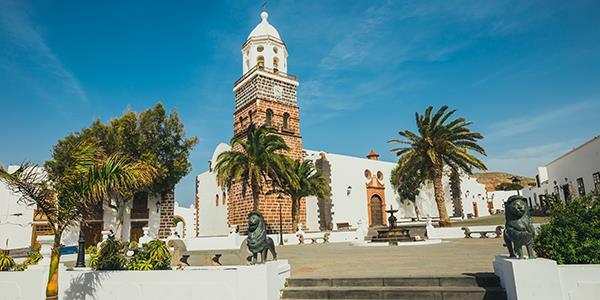 Teguise is one of the earliest towns on the island, founded back in the early 15th century on the site of an old aboriginal settlement. It was once the capital of the island, always a bustling place, and its Sunday market has grown and grown into the huge tourist attraction that it is today. Teguise Market takes place right in the centre of the town. What is usually a relaxed and sleepy place, comes alive on Sundays with stalls upon stalls of fresh food, local produce, souvenirs and goodies. There are hundreds of stalls, encouraging locals and tourists alike. Here you will find most things: handcrafted wares, pottery, vegetable stalls, wooden carvings, bags, clothes and much more. It has become quite famous across the island. The market is open from 9am to 2pm every Sunday, and it’s a good idea to get there nice and early, so as not to miss all the good stuff. To get there from Santa Rosa, you’ll need to get onto the LZ1 and then simply follow the LZ10 inland. Alternatively, there are special Sunday buses (line 11) that run from Costa Teguise, where Santa Rosa is located, all the way to Teguise market! A visit to Arrecife? Capital idea!